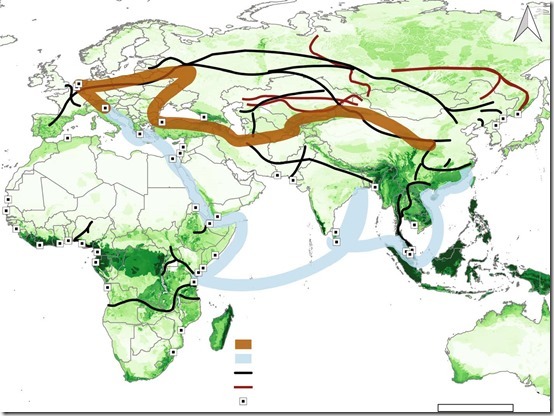 Belt and Road is an Important Emerging Issue for Global Conservation. In an article in the Journal "Trends in Ecology & Evolution" twenty-four experts in conservation research and practice, ecology, economics, policy, and science communication reviewed 117 potential issues and identified 15 priority topics following a wide consultation. They followed a Delphi like process to score and identify the most important. This is the ninth such annual "horizon scan" to identify emerging issues. Themes among selected topics include new mechanisms driving the emergence and geographic expansion of diseases, innovative biotechnologies, reassessments of global change, and one of them highlights the development of strategic infrastructure to facilitate global economic priorities. Guess what it is? In 2013, Chinese President Xi Jinping unveiled a strategic infrastructure programme that would support development of six major land transport corridors across central Asia. The corridors would link China to Europe (the belt) and link Chinese ports to Indonesia, ports around the Indian Ocean, and, through the Red Sea, Southern Europe (the road). The cost of completing the corridors, estimated to be $1.25 trillion by 2025, will deliver economic development, supported by considerable scientific and technological development, across Eurasia to Africa. Nearly 70 countries have agreed to cooperate in the plan. Given the growth of ecologically informed policies in China, it may be possible to develop the corridors in an environmentally sustainable manner. President Xi stated his ambition to create a big-data service platform for environmental protection, and to support climate change adaptation projects internationally. However, official documents currently do not appear to emphasise environmental assessment, and there are concerns that the investors may push such big infrastructure projects through quickly at the expense of safeguards, with a cascade of negative environmental impacts. For example, the proposed routes overlap protected areas supporting snow leopards (Panthera unica), Amur tigers (Panthera tigris altaica), and Far Eastern leopards (Panthera pardus orientalis). The anticipated and extensive industrial and infrastructure development across central Asia, exacerbated by resulting human immigration to the region, would compound the undesirable ecological changes that are anticipated as climate changes. Furthermore, any growth in trade throughout the region is likely to increase the risk of trade in endangered species and transport of non-native invasive species. The horizon scanning process is not intended to draw attention to phenomena that are widely understood to affect societal needs or values, including those related to all aspects of biological diversity. Instead, it is intended as an early awareness and alert system drawing attention to novel issues that, if realised, may create pivotal opportunities or threats and thus warrant further analysis in the near future. It supports the capabilities of organizations to deal better with an uncertain and complex future. For example, the authors also discussed as major issue the impending global hydropower boom, but later decided it was no longer an emerging issue. We know, that in 2017 at least 54% of hydropower capacity added in the word in was build with participation of Chinese firms and approximately 80% of world-wide investment in new hydropower came from China. Therefore “global hydropower doom” may be viewed not as a stand-alone issue, but as an intrinsic part of the Belt and Road Initiative.